The party was hosted by the General Employeesâ Cooperative Credit Union (GECCU), and the children, who settled in the schoolâs yard for the event, began the morning by singing a few Christmas carols and their school song. Some were then treated to snacks, while others rushed off to enjoy the bouncing castle. The excited children were even more hyped with the arrival of Santa Claus who was attacked by tiny screams of âSanta, Santaâ as the children converged on him to tell him what they wanted for Christmas. Santa then handed out gifts to the children. Speaking to the media, Camilla Mandeville, Chairman of the Education Committee of GECCU, said that it was easier to have a party for Imani preschool rather that having parties for all primary or secondary schools which have a co-operative. 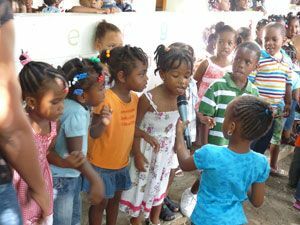 Imani is the only preschool that has a schoolâs co-operative.